Turtl was updated to version 0.7 yesterday, the new release shipping with a rewritten server, among other changes. I'll cover the new version in the second part of this article, after an introduction to Turtl. Turtl is a "secure, encrypted Evernote alternative". The free and open source tool, which is considered beta software, can be used to take notes, save bookmarks, store documents and images, and anything else you may need, in a safe place. There are Turtl applications available for Linux, Windows, macOS and Android, while an iOS application should also be available in the future. Chrome and Firefox extensions are available to easily bookmark the page you're on, great for quickly saving sites for later. The Turtl developers offer the service (hosted server) for free, but a premium service is planned for the future. However, the Turtl server is free and open source software, so you can install and use your own instance. 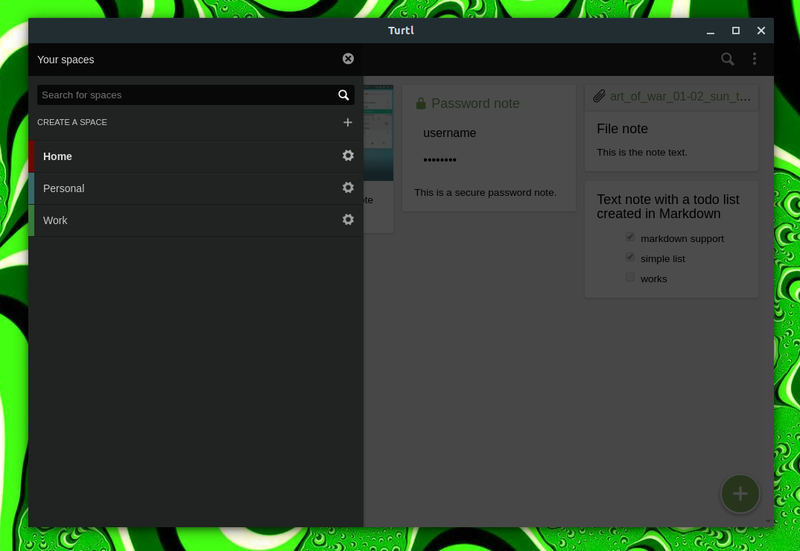 The Turtl application comes with 5 predefined note types: text note, password, file, image and bookmark. For note taking, Turtl uses Markdown, which an easily be previewed from within the application - since Markdown is a plain text formatting syntax, you're not forced to type in Markdown and you can simply type plain text. For those new to Markdown, the application provides a built-in formatting help screen to help you get started. You can also preview a note before saving it. The application organizes notes in boards and spaces (e.g. home / work), and supports tags so you can easily filter your notes. A search feature is also included, which lets you sort results by creation or last edited date. As for security, Turtl encrypts everything before any data leaves the application, using a key created when you log in, based on your email and password. As of version 0.7.0, released yesterday, libsodium is used under the hood for all cryptographic operation. Your password is not stored on any server, so make sure you keep it in a safe place because you won't be able to recover it. You can read more about encryption and security in Turtl here and here. There's no feature list available for Turtl, and that's all I could find regarding its features. 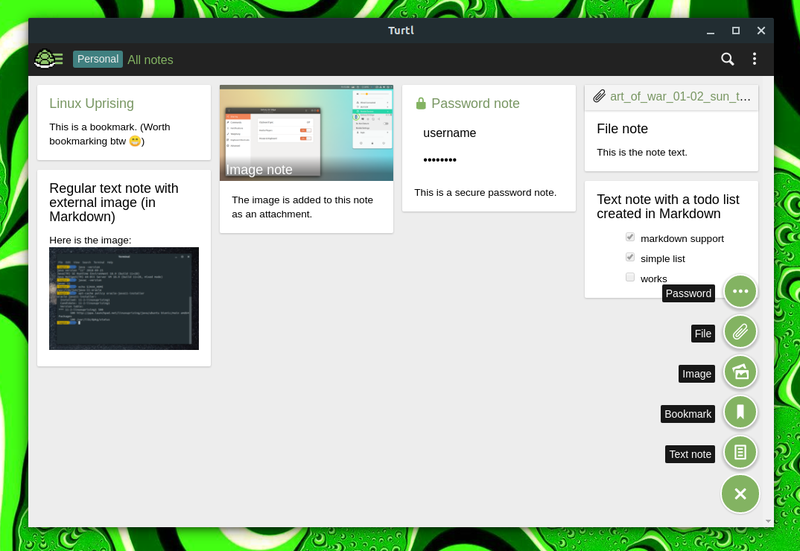 While its developers call Turtl a "secure, encrypted Evernote alternative", I'd argue about the Evernote alternative part because there are some missing features, even for my basic use. I don't care for all the Evernote bells and whistles, but there are a few things I'd like to see in Turtl (and not just an iOS app), like linking between notes, which I'm sure many find useful - this is somehow missing right now. I find being able to embed attached images as an important feature as well, and this is currently missing from Turtl (you can embed external images using Markdown though). The Turtl bug tracker list a multitude of features that might be added in the future though, like sharing of individual boards, handwritten notes, note importing from Google Keep and Evernote, password protect the "stay logged in" feature with a pin, and a command line client, among others. Now that the new server is done, hopefully the devs will look into adding some of these feature to Turtl. Under the hood, Turtl 0.7 includes a new "Core" component, built in Rust, that replaces most of the old application code. This is what handles the synchronization, sharing and cryptography now, allowing the JS project to only act as an interface. The new release includes "Spaces" (for example "Personal", "Work", and so on), which are essentially containers for your data that keep things separate from each other. These Spaces can be shared between users, while the old boards no longer allow sharing. The new Spaces feature available with Turtl 0.7 allows more granular permissions with sharing, making this easier to use with teams. The boards are still present in this Turtl release, but they cannot be nested under other boards any more, and sharing boards is no longer possible. Sharing individual boards might be implemented in the future though. It's important to note that due to the major changes in this release, old accounts need to be migrated to work with Turtl 0.7. The migration happens in the application itself. Also, while it was previously possible to create a Turtl account without an email address, that's no longer possible. Emails require confirmation only to enable sharing though. There are currently some issues with the migration process and logging in using old credentials, which will hopefully be fixed soon. Now that Turtl v0.7 is out, the developers say they will focus on the much requested iOS application. You can read about the Turtl 0.7 update here. There are Turtl desktop applications for Windows, macOS and Linux, and mobile app for Android. Chrome and Firefox bookmark extensions are also available. To install the application on Linux, extract the archive and then run the install.sh script as root (it installs Turtl into /opt). If you want to run your own Turtl server, check out this page.